Green Arrow: Sorry. You had to get off at an earlier stop. Damien Darhk: You can't be the Arrow. He died. So who are you? Green Arrow: You're about to find out. Green Arrow: Stop the train! Damien Darhk: No, I don't want to. Even if I did, I couldn't. I destroyed the braking system 20 miles away. Green Arrow: Willing to die to destroy a train station? Damien Darhk: No, that would be ridiculous. Green Arrow: Then how are you planning on getting off the train? Damien Darhk: Oh you don't know who I am, do you? I'm Damien Darhk. Arrow kicks off its fourth season with a refreshing, clean slate and lighter tone. 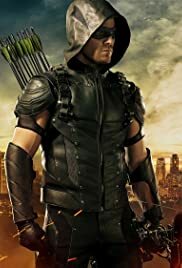 While not every aspect of the story or the writing was on-point, a new, compelling villain and a healthy dose of great action secures "Green Arrow" as a great way to start the year.